The National Organization for Women's president says the Obamas have "screwed up" by praising Walmart. As I’ve reported, OUR Walmart members have been on strike since last week, alleging retaliation against workers who’ve organized for improvements in their wages and working conditions. Strikers and supporters are in Bentonville this week for the retail giant’s annual shareholder meeting on Friday, as are thousands of other Walmart employees chosen by company management. On Monday, Walmart spokesperson Kory Lundberg described the week’s demonstrations as “the latest union-organized publicity stunt made up of mostly union activists and a small and insignificant amount of associates participating.” Asked about today’s protests, Lundberg referred The Nation to his prior remarks. The OUR Walmart members’ mid-day walk through the Walmart-funded museum—mostly quiet, single-file, in green shirts—coincided with a visit by some of the blue-shirted Walmart employees flown in by the company, and some Walmart managers who accompanied them. The two groups of employees looked at each other but mostly kept their distance. “It’s like they look at me like I’m crazy, because I’m wearing this, but don’t know I fight for them,” striker Gerardo Paladan told The Nation. Asked about the green-shirted strikers they’d just spoken with, Silva said she hadn’t realized they were on strike. “I didn’t even get to talk to them. I just got introduced, said hi to them and that was it.” As for OUR Walmart’s work stoppage, “I’ve never heard anything about it so I couldn’t really respond to that.” “They’re union,” said the zone manager. “They’re the ones that they warn us about.” Then she laughed, said she was going to get some coffee and left. Interviewed later about the same conversation, OUR Walmart activist Gilbert said that she’d introduced herself to the two blue-shirted workers and asked them if they’d heard about OUR Walmart. “They said ‘yeah,’ and it didn’t seem like it was a very good ‘yeah,’ but they had heard about us.” Gilbert added that when the OUR Walmart activists asked about issues at work, “they were all like really quiet about it,” and then “we just had small talk.” She said that OUR Walmart members had met greater success visiting employees at area Walmart stores earlier in the week, and suggested that wearing OUR Walmart shirts today had made other workers more scared to talk to them. “We could reach everybody if we just get the opportunity,” she said. Most of the blue-shirted Walmart employees in the museum cafeteria this afternoon declined to be interviewed (“I don’t know if we’re permitted to socialize with media,” said one). A group of Washington employees at one table were effusive in praising their trip, but became reticent once I brought up their green-shirted counterparts. “We have no comments about that,” said one. “They can do their own thing, but we’ll do our own,” said a second. “They’re in the wrong dress attire for us,” a third said with a laugh. 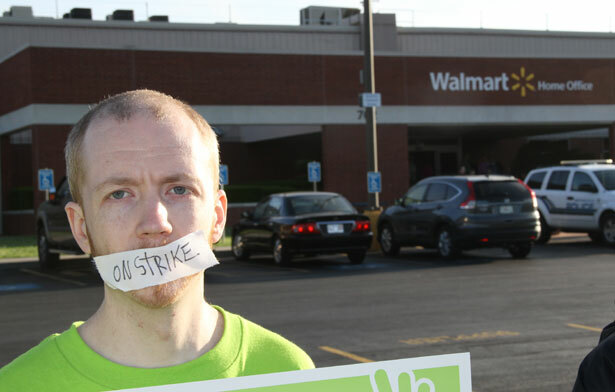 Lancaster, Texas, OUR Walmart activist Colby Harris told The Nation that he’d repeatedly seen Walmart management swoop in to disrupt or avert potential conversations between OUR Walmart members and the workers brought to town by Walmart as their paths crossed over the week. Today’s protests followed OUR Walmart events yesterday including a noon demonstration at Walmart’s Bentonville headquarters, and an evening forum focused on Walmart’s impact on communities and the broader economy. Speaking to a half-full Northwest Arkansas Community College auditorium and an online livestream audience, leaders from groups including Color of Change, the National Congress of Black Women and the National Organization for Women urged support and solidarity for the Walmart workers’ efforts. As George Zimmerman's trial approaches, black men are still in the line of fire. Read Mychal Denzel Smith's take.